On the beautiful southern coast of Mykonos, about nine kilometers from its center, this fantastic beach of sand and pebbles is one of the longest of Mykonos’ many fine beaches. 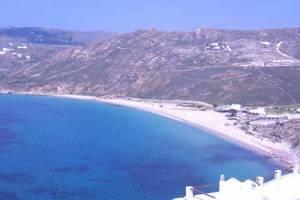 It is accessible by public bus from Mykonos Town and by caique from Platys Yialos. It features a relaxing environment and outstanding sea views. Most of Elia Beach is organized with sunbed and umbrells facilities, but one can choose to work on his or her suntan using private means. A tiny gorge mouths out on Elia Beach. Although it is dry in summer, it is worth a very cautious visit. If you manage to remain still for some time, you'll start seeing movement around and you may be lucky to hear some rare bird sing! Mykonos Elia Beach; we are in Greece, afterall. Mykonos Elia Beach: far end without umbrella facilities.